Will I need to file for a local building permit? What do I need to do to have my system installed? Do I need an automatic gas shut off valve? Is training required to my employees? Will my system meet all code requirements? How do I find a local installer for my fire suppression system? What is the expected installation price with your authorized installers? What if I want to add cooking equipment in the future? How often does my fire suppression system need inspected and by who? If my system goes off, how do I clean up? What is a class K rated fire extinguisher? What if I decide to change my appliances? What is my money back guarantee? How much will I save? Depending on the system size, you will save over $1000 going factory direct with us. Local distributors purchase the parts and equipment through several wholesalers and retailers which equates to your heightened cost. At the Fire Protection Depot, we eliminate the need of the middle man and red tape that you are used to paying for, and provide you with a fully compliant fire suppression system at factory direct pricing. How are these savings possible? Because an fire suppression system is a highly technical and not often ordered item, the markup on these systems by local installers is high because of the stocking, shipping, training, employee costs, engineering costs and more. At the Fire Protection Depot, we have a stocking warehouse of all of the parts necessary to ship out your prepackaged fire suppression system right away. And with our customized system calculator, you get the fire suppression system designed specifically for you without paying an engineer to design for you at no cost. Will I need to file for a local building permit? The answer to this is provided by the local installer that you chose from the authorized installers provided to you. Depending on where your place of business is, a permit is required, but is handled by the installer, they will take care of the complete permit process with your local code administrator. Typically fees for this permit by your authority having jurisdiction are around $50.00. What do I need to do to have my system installed? Well, we handle that for you, with our complete installation guide, we will walk you through the entire process from getting your complete system to your door, to setting you up with a local discounted certified installer. You have enough to worry about with running your restaurant, let us handle this headache for you. Do I need an automatic gas shut off valve? Not necessarily, many restaurants have all electric appliances, so there is no need, for a gas shut off valve. Also, because many of our customers are replacing an existing system the gas valve is already present, so there is no need. For the most part, it is only new construction installations that will need the gas shut off valve, which is why they are sold separately. Is training required to my employees? Yes, and we at the Fire Protection Depot provide you with a complete annual employee training guide and log to be used to comply with your fire protection training requirements, don’t worry we’ve got you covered. Will my system meet all code requirements? Yes, your fire suppression system is in compliance with NFPA17A, & NFPA96 and conforms to UL300 test standards, all of which are requirements by your local code enforcement and your insurance carrier. How do I find a local installer for my fire suppression system? We will provide you with the local installers contact information, we have a nationwide network of over 1000 authorized installers of our fire suppression systems. What is the expected installation price with your authorized installers? Due to the volume of business that we provide our installers, the install price is actually lower than going direct. Not only do our network of installers benefit from a free customer lead to perform work, they have instant access to provide you with the required semi-annual service and be a customer for life. Therefore the installers want to work with both of us, as it is a win-win situation. We are helping them cut marketing and overhead costs by finding you. With that being said, you can expect to pay between $500 – $750 for the installation, which combined with the discounted system pricing, and allows you to save over $1000 over outsourcing for yourself. Now That’s a Savings! Fire test standard UL 300 has been a major factor in significant changes in how commercial cooking operations are protected from fire. This report looks at the background of UL 300 and changes in related NFPA National Fire Code documents. The dilemma of what to do about existing fire protection systems is also discussed. 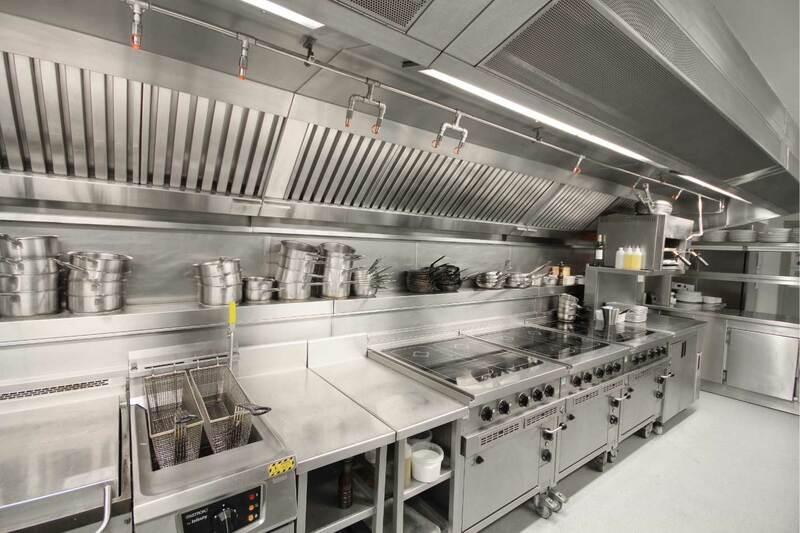 In 1998, a revolution in the fire protection of commercial cooking operations occurred. Several key fire protection standards were revised. While protection requirements for new installations seemed clear, fire protection professionals found themselves in a quandary over existing installations. The changes raised doubts about the ability of existing fire protection systems to provide adequate protection. Questions arose as to which systems needed to be upgraded, the length of transition time that should be allowed, and the difference in loss exposure between existing protection and new criteria. A driving force behind this fire protection revolution is one fire test standard developed by Underwriters Laboratories, Inc. (UL). First issued in 1992, UL 300, Standard for Safety for Fire Testing of Fire Extinguishing Systems for Protection of Restaurant Cooking Areas, affects how kitchen fire protection systems are tested. The revised standard is intended to provide test conditions which more closely resemble the hazards faced in “real world” fire situations. Use of dry chemical agent. Use of a single nozzle to protect multiple appliances. Use of a single nozzle to protect a combination griddle/range. To date, no dry chemical system has been listed under UL 300. However, existing dry chemical systems (separate from the system protecting the cooking appliance) may still be used for plenum and duct protection. UL 300 requires that multiple appliances be covered individually unless a specific listing is in the manufacturer’s design, installation, and maintenance manual and the manufacturer must specifically test this arrangement under the UL 300 test standard. All new restaurant fire protection systems manufactured after the above effective dates must comply with UL 300 to qualify for a UL Listing. Those systems, which receive the UL listing, are published in UL’s annual Fire Protection Equipment Directory. All new restaurant fire protection systems manufactured after the effective date of November 1994 must comply with UL 300 to qualify for a UL Listing. In addition, NFPA 96 requires that such fire-extinguishing systems comply with UL 300. Used systems (or new systems manufactured prior to November 1994) that do not comply with UL 300 should not be installed. 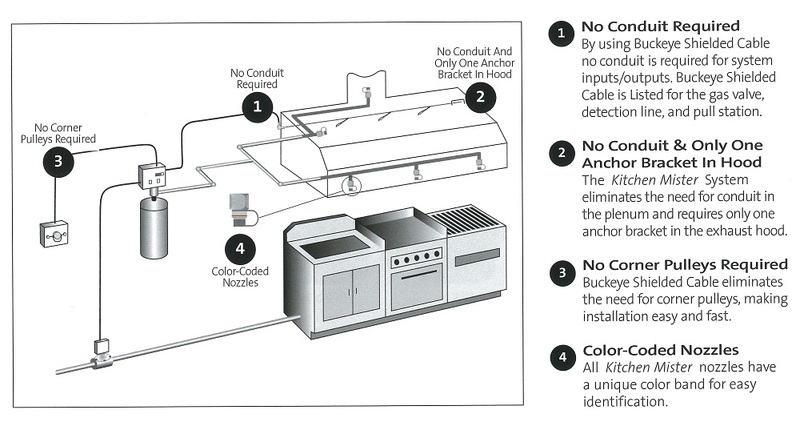 UL does not “unlist” restaurant fire protection systems that were listed prior to the implementation of UL 300. Such systems continue to qualify as a Listed product as long as the system is in compliance with its original Listing requirements. What if I want to add cooking equipment in the future? The time to think about that is now, it is much more costly to do it down the road. What we suggest is that when you are using our custom system calculator, add in the equipment on your wish list, this will allow you to get a big enough system to handle your needs should you decide to grow. If you do not do this, you will need to get a an additional tank and bracket down the road to substantiate your growth. The rule of thumb here is to spend the extra $150 or so now with a bigger system, than to have to upgrade to a larger system later for an additional $600 plus. How often does my fire suppression system need inspected and by who? You must have your fire suppression system inspected at a minimum semi-annually by a trained qualified and certified company. Do not worry, we will put you in touch with these companies to ensure that you are in full compliance and at very competitive pricing. If my system goes off, how do I clean up? Basically you must clean up the affected area immediately with your regular cleaners that you already use. This information is found in your owners manual as well. The great thing about the systems provided by us is that they are wet systems, and will not cause damage to rest of your kitchen like the old dry suppression powder systems. What is a class K rated fire extinguisher? It is a requirement in commercial cooking applications under NFPA10 which is the code guideline used by your insurance carrier. Our Wet Chemical extinguishers contain a blend of Potassium Acetate and Potassium Citrate that is extremely effective in suppressing high temperature fires involving cooking oils and grease. The units incorporate a spray nozzle that ensures the agent is applied gently to the burning oil thus preventing splashing. It’s unique cooling properties deliver exceptional heat absorption ensuring the fire remains out. Wet Chemical is suitable for use on Class A and K fires and is the only fire extinguisher needed in the cooking area, for a discharge of a dry chemical fire extinguisher in a kitchen will virtually destroy your kitchen leading to thousands of loss dollars with food wasted, cleanup, down time, etc. The Class K fire extinguishers are a wet chemical extinguisher designed to isolate the cleanup situation to the fire zone, clean up and back up and running in under 30 minutes after use. What if I decide to change my appliances? Because your system is predesigned based on your cooking equipment and proximity, it is important to understand that any changes to your cooking line must be immediately addressed with us, for example if you replace a griddle with a fryer, the nozzle that is to be used requires more chemical for the bigger degree of hazard with the fryer and must be a different chemical disbursement o prevent splashing of the fryer oils. In this case, a different nozzle can be purchased from directly from us and you need to change it. Should you move any appliance, the piping must coordinate with the moving of the equipment to provide ample protection. This is also part of the reason that your code enforcers and insurance companies require the semi-annual inspections, to ensure all equipment is protected properly. What is my money back guarantee? We stand behind our guarantees 100%, if for any reason you find that the system will not suffice your needs, just return it to us within 30days to receive a full refund of your purchase price, less shipping cost.